Loved ones are still fighting for recognition of servicemen 40 years later. camera (J. David Ake/AP Photo) A visitor at the Vietnam Veterans Memorial in Washington passes early in the morning on Veterans Day, Nov. 11, 2013, to look at the names inscribed on the wall. Just off the National Mall in Washington, D.C. stands a large, black stone wall, more than 245 feet in length. 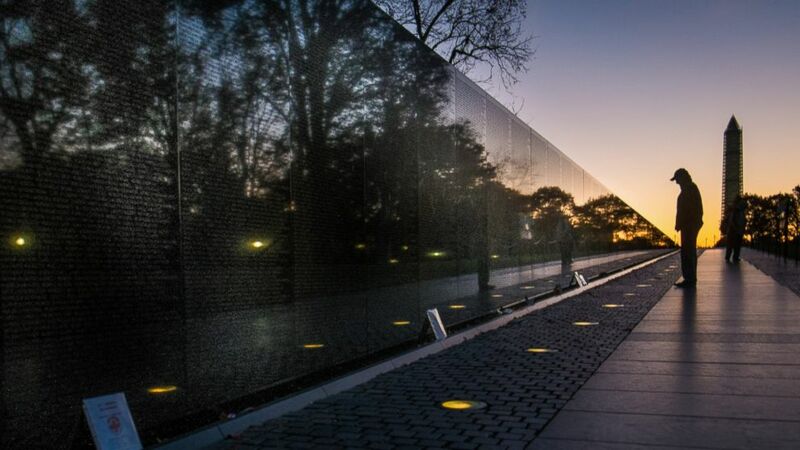 Etched in its reflective surface are 58,286 names of U.S. service members who lost their lives decades ago a half a world away. This is the Vietnam Veterans Memorial, but some believe it is incomplete. Nearly 40 years after the war’s end, some families are still fighting for their loved ones’ service to be recognized, and for their names to be inscribed onto the slab of smooth granite. On a wall with more than 58,000 names, how hard is it to add another 74? Harder than you might think. For more than three years, Rep. Adam Schiff, D-Calif., has been working with members of the Frank E. Evans Association, a group of former service members and families, who have long been fighting to have 74 names added to the memorial. The names belong to men who lost their lives aboard the USS Frank E. Evans during the war, and have been left off the memorial, they say, because of a technicality. But a new push by Schiff to have Defense Secretary Chuck Hagel recognize these fallen servicemen has brought new hope to the families. Schiff recently met with Hagel, a Vietnam vet himself, to ask for help. Indeed, for the California congressman, the story hits close to home. One of his constituents lost his father on the Evans, and brought the story of the ship to Schiff. After leaving the United States for Vietnam in March 1969, the USS Evans arrived in Vietnamese waters in early May. It served as naval gunfire support until the end of the month when the ship left its post to get more supplies. While reloading, the Evans was ordered to take part in a training exercise with 40 other vessels in the South China Sea. It was during that exercise that the Evans collided with an Australian aircraft carrier, the Melbourne, ripping the Evans in half. Stephen Kraus, the vice president of the Frank E. Evans Association, was on duty that night. Among those who served aboard the Evans were Gary, Gregory and Kelly Sage, three brothers who had requested to serve together. It was choice that anguished their father, Ernest, according to his daughter-in-law, Linda Vaa. Vaa was the high school sweetheart of the middle Sage brother, Greg. The two were married, and had in infant son together when Greg left for Vietnam in March 1969. News that the Evans’ had been involved in an accident left the Sage family in agony for hours. Finally, a call confirmed the worst: All three boys were killed in the collision. The accident left Ernest and Eunice heartbroken. “Ernie just put all his head in his hand and just kept saying ‘I’ve lost all my boys!’” Vaa remembers. But the Sage family took comfort that the brothers’ service would be recognized with a place on the memorial. That was until they discovered it would not be the case. But the Sage family was told it was no mistake. The Department of Defense ruled that the names of the Sage brothers -- and those of 71 other who served on the same ship -- would be left off the wall because of the location of the ship at the time of the accident. Although the ship was in Vietnam waters just before the accident, it was 110 miles outside what is known as the “Combat Zone” when its forward section sank. More than 300 names had been added to the wall as of Memorial Day 2013, according to the Vietnam Veteran Memorial Fund. Fourteen new names are slated to be honored on the wall in May. Some of these cases bear a striking resemblance to the Evans tragedy. One of the exceptions occurred in 1983 when President Ronald Reagan ordered that the names of 68 marines who died in a plane crash on their way back to Vietnam after leave should be honored on the memorial. Because the plane had orders to return to the combat zone, officials decided that their names qualified. The Evans Association tried to apply this reasoning to the 74 men lost on the ship, but the group was told that there was no official indication that the Evans would return to the combat zone. In a recent interview, Louise Esola, who has spent four years researching the Evan’s tragedy, and wrote a forthcoming book, “American Boys: The True Story of the Lost 74 of the Vietnam War,” said she disagrees. “It’s absurd for the Department of Defense to say that there was no proof that the Evans was going back to the gun line, because every ship went back there,” she said. Adding to the frustration of the families, the ship was supposed to have received its 15th Vietnam Service Medal for the work they did the very day it sank. Members of the Evans Association have tried fruitlessly for years to have their fallen comrades and family members recognized. Three previous attempts to create legislation to add the names did not get far -- all three failed to make it out of congressional committees. So, members of the Association and Schiff, the California lawmaker, decided to take a more direct route: lobby the Pentagon. The secretary of defense can order names added to the memorial, but the congressman said his lobbying attempts on two previous secretaries had little traction. Schiff said he is hopeful that the first Vietnam veteran to serve in this position will help Kraus and the rest of the Evans Association in their effort. But the department has refused to show its cards. “Rep. Schiff discussed his concerns during a visit to the Pentagon,” Lt. Commander Nate Christensen, a Pentagon spokesman, said in a statement to ABC News. “The Department is aware of the representative's concerns." No matter what, Kraus promises his group will not give up.